Hampi was the capital of Vijayanagar Empire, the last great Hindu Kingdom. Under the Vijayanagar rulers Hampi grew fabulously. The princes of Vijayanagar built numerous Dravidian temples and palaces. The records of foreign travelers between 14th and 16th century bear testimony to the grandeur of Hampi. However the magnificent capital of Vijayanagar was destroyed by the Deccan Muslim league in 1565. Hampi is a village in northern Karnataka, India. It marks the ruins of Vijayanagar, the former capital of the Vijayanagar Empire. The Hampi village also houses the well-known Virupaksha temple. 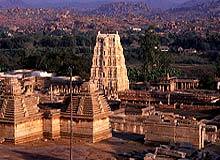 Hampi contains several monuments belonging to the erstwhile capital city. The Hampi ruins are a UNESCO World Heritage Site. Hampi is also identified with the legendary Kishkindha, the monkey kingdom mentioned in the Ramayana. The rulers of Vijayanagar chose Hampi as their capital because of its strategic location. Hampi was bounded by the Tungabhadra River on one side and granite cliffs on the other three sides. The ruins at Hampi bear testimony to the patronage of the Vijayanagar rulers to art and architecture. Excavations at Hampi have unearthed beautiful temples, one of them underground and also the ruins of once splendid palaces and gateways.